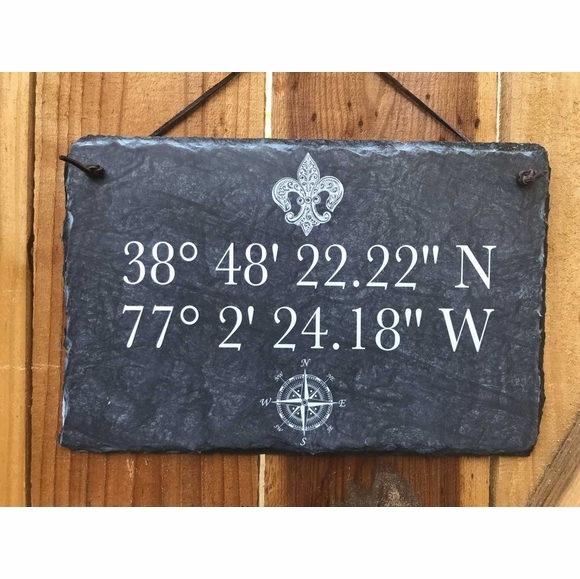 Slate Coordinates Plaque - - displays the longitude and latitude of your home address. Made in USA. All signs contain the latitude and longitude you specify under the address. If you know the coordinates you want, please type them into the corresponding Longitude and Latitude input boxes in the exact format shown in the samples (degrees minutes seconds direction). Otherwise, leave the longitude and latitude boxes empty and provide the complete address of your location (number, street, city, state, and zip) in the Complete address input box. We will determine the correct numbers for you. Colors: charcoal gray with chalk white wording and accents.